Script Generation Wizard. Free version generates scripts to photograph Diamond Ring and corona. Pro includes 8 additional phenomena. Script editing and customization inside application. Customizable main screen data display. Map, simulated view & countdown in separate, resizable windows. Support for smaller "netbook" screens 800x480 and larger. 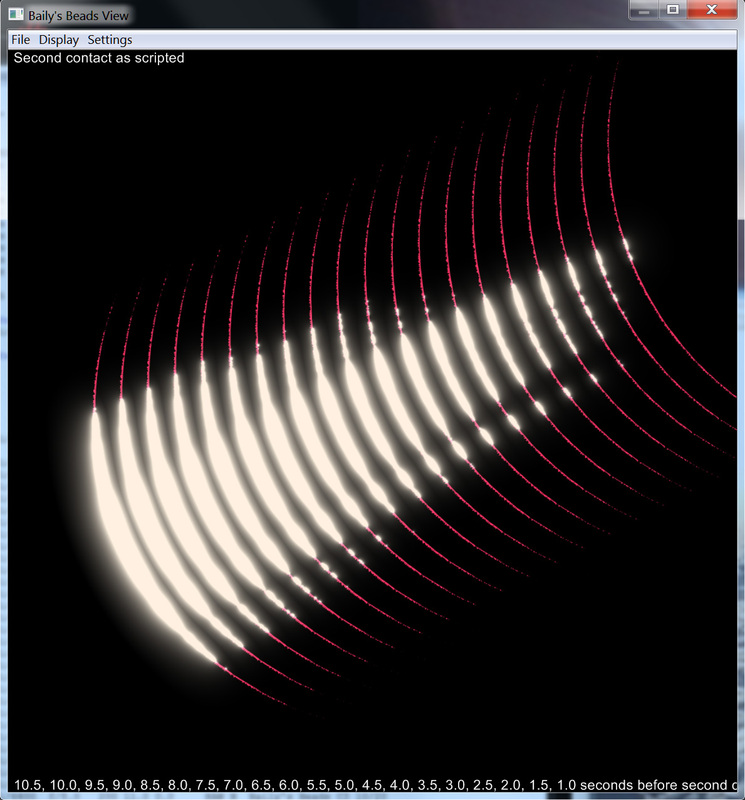 Scriptable intervalometer function, including "ending at" feature. Take single exposure with settings dialog. Global Exposure Compensation feature to shift all exposure times in case of clouds/haze. Animated umbral shadow with mouse-over duration info, to instantly see how long the eclipse is at each point on the map. 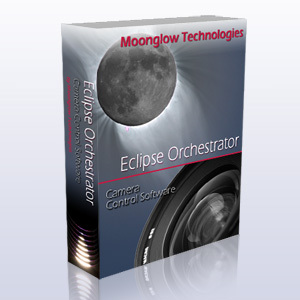 Calculation and display of eclipse local circumstances, with capability to reference camera script items to eclipse events ("5 seconds after second contact", "at 50% magnitude", etc.) or use absolute UTC date/times. See screenshot of advanced timing options. Refraction, limb effects, and delta-T correction supported. UTC event times for subsecond accuracy. Manual entry or override of computed contact times if needed. Easy adjustment of computer clock: a static offset correction can be entered if no GPS is connected. Simulated time support (fudges clock without affecting Windows system time) to allow easy rehearsal. Simulated Sun image and large event countdown display. Color coded duration map indicates where to move to increase your eclipse duration. Support for easily-launched "emergency" script to adapt to cloud openings. Scripted control Canon or Nikon DSLRs (see supported camera list) over USB/1394 connection, with full control of shutter, aperture, ISO, and file type/quality. Images are stored to the camera's memory card, not the computer. Serial port cable support for high speed shooting on a USB/Firewire connected camera (Pro only). Using this cable (not included) up 2-5 seconds of delay time can be saved. Typical speeds using the cable can be 2-8 frames per second. Powered, inverted and Nikon IR shutter cables supported (Pro only). Scripted shutter press control (via serial port cable) (Pro only). Powered or non-powered serial RTS, DTR and dual type cables supported. Mirror lock up support (requires serial port cable) to reduce mirror slap vibration (Pro only). The exposure is set (if applicable), the shutter button is pressed to lock up the mirror, a wait is performed, and then the shutter is pressed again to actually capture the exposure. Wait times adjustable per exposure. Scripted playback of self recorded *.wav sound files for reminders as desired, such as "filters off!". Please be considerate of others when using this feature. Neilsen-Kellerman Kestrel 4000 (with Kestrel Interface) weather tracker support, for scheduled memory downloads and near-real-time graphing (Pro only). Serial port NMEA 0183 GPS support for position and time information. Highly stable timing via 1 pulse per second signal when specially cabled Garmin GPS18(x)-LVC used (Pro only). Can send scripted arbitrary byte sequences over serial ports (up to 128 bytes long) (Pro only). With proper converters, cabling, and programming this can be used to slew a motorized telescope, or zoom a video camera in and out, etc. Can execute scripted command line action, to launch an external program or command at a specific time. Continue on to read about Equipment support & requirements. All text and images are © 2008-2017 Moonglow Technologies - All Rights Reserved.